LED floor lamps offer energy efficient lighting; this design also features a stylish pharmacy style lamp head and thin profile. In a dark brass finish, this LED floor lamp features a sleek two pole design, side dimmer and two adjustable gooseneck points to create the perfect amount of light for tasks, reading or just relaxing. Beautiful and energy-efficient! 59" high when fully extended upward; 38" lowest height. Round base is 10" wide x 1 1/2" high. 3/4" center pole. Light head is 5" wide x 3 1/2" deep x 1 1/4" high. Built-in 6 watt LED. 480 lumens. 4500 color temperature. On-off dimmer knob on top of side pole. 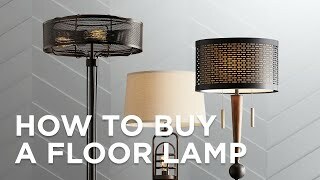 Energy-efficient LED floor lamp. Features two adjustable goosenecks at center pole and head. Liked the style, color, and adjustable light. Adjustable height and because its brass. Hopefully the light illuminated area will be adequate. I was looking for an LED task light, a contemporary style with an ultra small profile. This looks perfect. Height and flex adjustment, dimmer switch, light profile. Needed a floor lamp to use by my home organ -- something that is flexible and will shine on the music. Great Light. Small profile. Very upscale "Look"
My wife has one and we like it. Is the led a "cool" bright white light or "warm" white light? BEST ANSWER: Hi - this has a 4500 color temperature which is between a cool white and daylight color tone. I finished the assembly - yes, unclear instructions. But my big question is where is the on/off/dimmer switch? I plugged in the light and it was in the on position. But there is no switch anywhere that I can see. BEST ANSWER: At the top of the smaller rod is a small dimmer knob. I have emailed you a copy of the assembly instructions which will show the dimmer location. The light switch is the skinny rod aside the shaft of the lamp. However, mine has come loose at the top of the rod. It needs to be tightened from the bottom. The cover at the underside of the base has to come off to tighten from the bottom. I don't want to take it apart. I have to twist the rod from the base to turn on and off or adjust the light brightness. I like the look, the LED, and that it has a dimmer. But the quality of construction is lacking--or my ability to assemble it correctly has been lacking. I wish the customer well. Can the built in led be replaced? BEST ANSWER: Hi - the LEDs are built-in (integrated) and non-replaceable at this time. If you should ever need to replace them in the future, please contact our Customer Service Department for assistance. But, they have an approximate life expectancy of 35,000 hours. Have recent purchasers found assembly any easier? Maybe the manufacturer has gotten a clue??? Very attractive lamp BUT . . . . 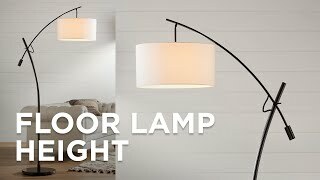 I did a lot of research to find just the right lamp and finally decided on this one--right size, brass finish and satisfied the purpose of a reading light. We really like the style. However, it took two intelligent persons (in this household) about one hour to assemble. The problem lies in the poorly written instructions. It seems the manufacturer would have one of the engineers assemble the lamp which would bring to light the typos and lack of clarity. As well as lack of what is what piece (no diagram of what a piece looks like), where is the on/off switch. Honestly, how hard is it to find the switch? We had to call customer service for instructions on what connected to what and where the switch is located (By the way, it is the little screw at the top of the outside pole--neat once you know what it is.) 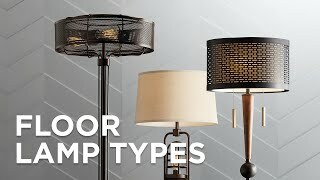 Bottom line, the lamp looks worth the value of nearly $100 but beware of getting it assembled. I'm so much enjoying this beautifully simple reading lamp with its versatile range of illumination that I'm considering buying a second one. Putting it together was quite straightforward. Perfect for my decliner when I sit or lie there to read. Looks well made and easy to assemble. Love it. My mom and I chose this lamp for use in the living room so that she could read in her easy chair. The lamp is not very stable on the rug. As well it is too difficult to turn on and off. We are returning this lamp. Very happy with this lamp. We really are enjoying these lamps. They're the perfect fit for our bedroom. We use these lamps as our main light source for reading. Fast delivery. Good price. Ordered on-line without problems. This is a company that lives up to their advertising! Service was great, easy to chat or speak with customer service; gracious and informed help. This lamp is very adjustable both in terms of positioning and the intensity of the light. Love this lamp! Its understated beauty is perfect beside my chair in the living room; and the illumination makes it perfect for reading. No glare on the pages. This lamp is low profile and will be good for reading or for low illumination of an area. It is not easy to put together as it comes with a bag of small parts and two allen wrenches. Once we got it together we could not find a place to turn it on or off much less dim as the instructions say. I came back to this site, and found the instructions "On/off dimmer switch on side pole." The tiny dimmer switch is NOT on the side of the pole. It is at the very end of the shorter little rod. There is a little knob that rotates. I would have given this lamp a 5 star if the instructions had been more clear. Changing the light bulb in the future should be an ordeal. Hi Betty Z., this lamp actually does have a dimmer switch on the pole. Try twisting the top of the pole and see if it works for you. If you still have trouble, please reach out directly to our customer service team and they will be more than happy to help you. Thank you.